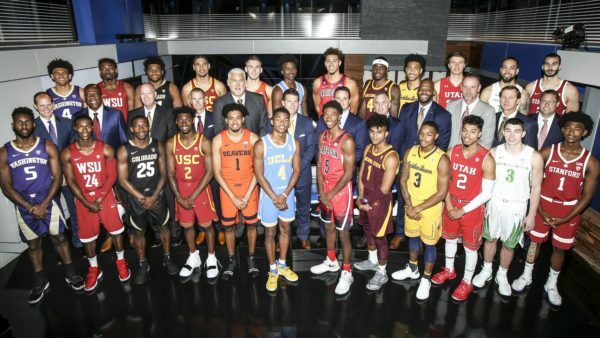 A great focus of Thursday’s Pac-12 Basketball Media Day was “evidence.” It came up as both a recommendation from the Pac-12 as well as an implemented rule that the NCAA can use third-party investigations (evidence? information?) to enact punishment. 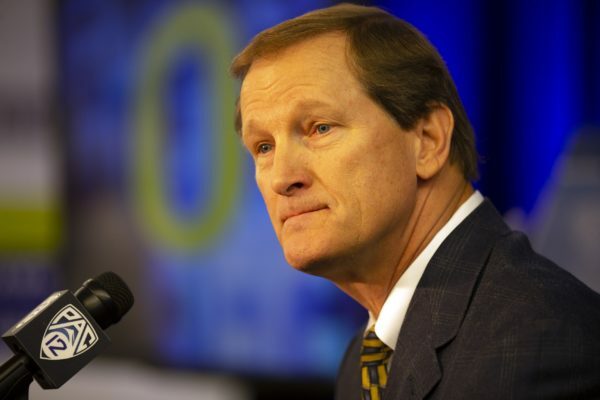 Further, in defending the conference and an allusion to wide-spread corruption (half of the conference’s teams have been mentioned in a federal court in Lower Manhattan this week), commissioner Larry Scott referred to last November’s NCAA charter that all schools conduct internal investigations regarding their compliance. In doing such, the Pac-12’s member institutions found no EVIDENCE of wrongdoing. Arizona – Sean Miller went out of his way, unprompted, to mention his star freshman, Brandon Williams. 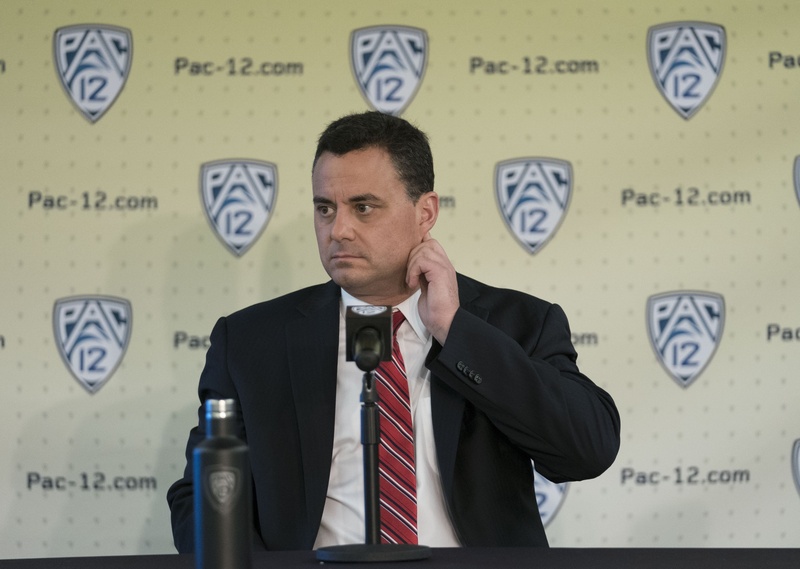 When he committed to the Wildcats for the second time, Miller had secured the top point guard recruit of his Arizona tenure. Further, Miller has managed to bring in some intriguing graduates (Justin Coleman, Ryan Luther) to help stabilize an unproven roster — and, in fact, naming Coleman a team captain. Arizona State – Remy Martin showed flashes of scoring brilliance and an ability to slash and shoot, suggesting little drop off from the Tra Holder era. Beyond that, the Devils introduce Zylan Cheatham (SDSU transfer), Luguentz Dort (5-star recruit) and Taeshon Cherry (4-star recruit) to an already intriguing set of athletic forwards (Mickey Mitchell, Romello White) with the hope of improving on a porous defense. Bob Hurley spoke – almost to a man – about defensive prowess and ability. RTC is providing coverage from start to finish of the NCAA Tournament, including this weekend’s Final Four in Phoenix. North Carolina Survived, Part I. With a little more than four minutes remaining in the first half, Oregon hit a three-pointer to go up by eight points. North Carolina’s offense to that point was sputtering with a shooting percentage in the high 20-percent range, and nobody other than Kennedy Meeks seemed to be able to find the range. From that point over the next eight game minutes spanning the halftime break, North Carolina went on a 26-8 run to take the lead and never relinquished it. The feeling around the building was that the Tar Heels — which has more offensive options on its roster — had dodged a bullet. Oregon stars Dillon Brooks and Tyler Dorsey were a combined 2-of-11 from the field for just 10 points, and although several other players (most notably, Dylan Ennis) had stepped up, it was clear that the Ducks had wasted a golden opportunity. Once the Tar Heels’ offensive machine got rolling on the back of Justin Jackson along with Meeks, Oregon was in big trouble. North Carolina Survived, Part II. Until it wasn’t in big trouble. After spending most of the second half nurturing a working lead in the 5- to 10-point range, the Ducks kept chipping away at it until the Tar Heels finally relented. A late Oregon run — punctuated by perplexingly awful decision-making on both ends — cut the North Carolina lead to a single point with seven seconds remaining, setting in motion a seemingly impossible finish. Two missed free throws by Kennedy Meeks led to an offensive tip-out and the Tar Heels retaining possession, followed by another foul and two more missed free throws from Joel Berry, an offensive rebound by Meeks, and the Tar Heels again retaining possession. 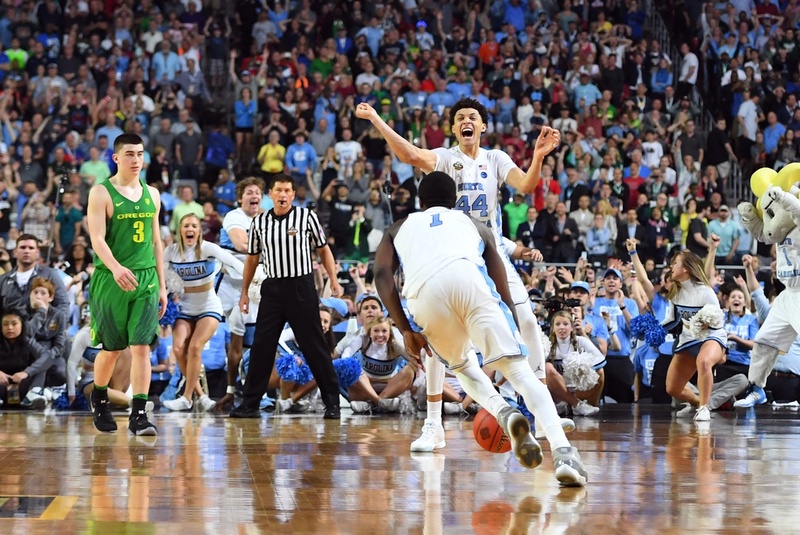 With four seconds remaining, there was more than enough time for Oregon to make a push up the court and find a decent shot, but that idea was quashed by North Carolina’s relentlessness on the glass. 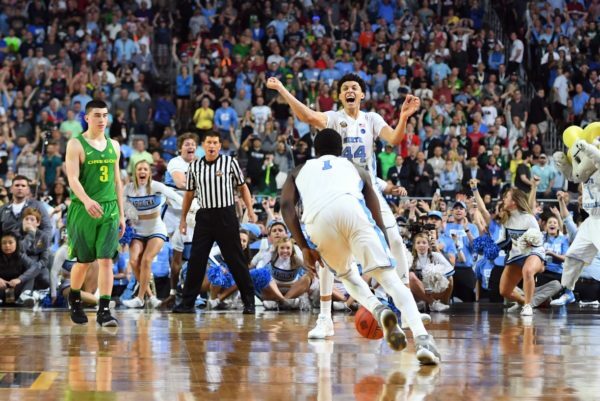 After the Heels had gifted the Ducks two incredible opportunities to win, it seemed a fitting way to end a game that had gotten very ugly down the stretch. Survive and advance comes in many different forms, but four missed fouls shots followed by consecutive offensive rebounds was a first. Oregon Needed a Productive Dillon Brooks and Tyler Dorsey. The Ducks were only going to go as far as their two offensive stars took them in this NCAA Tournament, and both Brooks and Dorsey were clearly bothered by the North Carolina defense tonight. In a contest where few outside shots were falling, the Heels forced the pair into a 5-of-22 disaster (3-of-10 from three-point range) that caused the Ducks too many empty offensive possessions. Compare that with the 9-of-18 from three-point range the pair hit against Kansas, and it’s easy to see why Oregon spent most of tonight playing from behind. Excellent efforts by Ennis (18 points) and Bell (13 points) kept the Ducks within range, but North Carolina was simply too good to force the Oregon stars into a tough night and not take advantage. The Tar Heels are moving on because they were able to contain these guys. Star of the Game. Kennedy Meeks, North Carolina. Meeks went into Beast Mode tonight against an Oregon front line that basically consisted of Jordan Bell and the aura surrounding him. His 14 points and five rebounds in the first half kept the Tar Heels afloat while awaiting the arrival of Justin Jackson (who finished with 22 points), and it seemed as if he was in the right spot at the right time every time Oregon appeared to be making a push. Perhaps this was illustrated no better than in the final sequence when, after missing a pair of his own free throws, he secured the game-winning offensive rebound after Berry’s misses, unloading the ball quickly into the backcourt before Oregon could foul yet again. His 25 points and 14 rebounds were both team-high totals, and it’s an accurate statement to say that Oregon would have won tonight if not for Meeks’ contributions. Now that we’re down to the Final Four, let’s take a deep dive into each of the four remaining teams. Today: Oregon. Oregon hopes to continue riding high in Phoenix (Getty Images). Midwest Region Champions. After receiving a lower-than-expected #3 seed on Selection Sunday, Oregon rolled past #13 Iona 83-67 in its NCAA Tournament opener. Two nights later, it required a pair of clutch Tyler Dorsey three-pointers for the Ducks to survive #11 Rhode Island, which led by as many as 10 points in the second half. Oregon’s late-game execution continued against #7 Michigan in the Sweet Sixteen, where it held the Wolverines scoreless over the game’s final two minutes en route to a 69-68 victory. 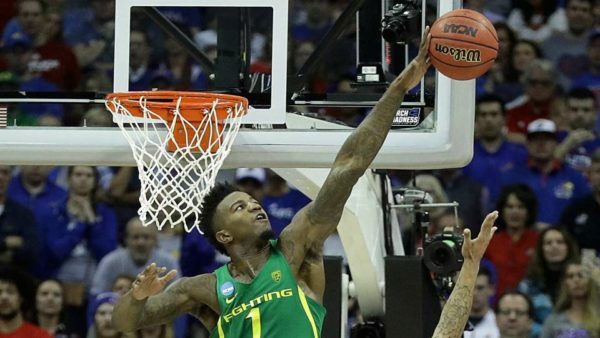 Finally, despite facing #1 Kansas in Kansas City on Saturday—a road game by almost any standard—the Ducks drilled 11 three-pointers, held the Jayhawks to their worst offensive output of the season (0.94 points per possession), and advanced to their first Final Four since 1939. Dana Altman. The 58-year-old Nebraska native has quietly had one of the most successful careers among active Division I basketball coaches — a career now punctuated by his first Final Four appearance. Altman ranks 10th on the all-time wins list among working head men (597 wins), joining Jim Boeheim, Mike Krzyzewski, Roy Williams, Bill Self and Tom Izzo as the only active coaches with 20+ consecutive winning seasons. After spending 16 years at Creighton (and becoming the Bluejays’ all-time winningest coach in the process), Altman has turned an inconsistent Oregon program into a perennial threat to win the Pac-12. Prior to his arrival, the Ducks had reached the Sweet Sixteen three times in program history, and won 30+ games only once; since Altman took the job in 2011, Oregon has doubled that number of Sweet Sixteen appearances and won 30+ games twice. He may well be a future Hall of Famer. And then there were three. USC did the Pac-12 no shame in winning two games during the NCAA Tournament’s first weekend, but the Trojans were felled by the neon shine of Baylor on Sunday, leaving the Conference of Champions with three teams in the Sweet Sixteen (as most had predicted). 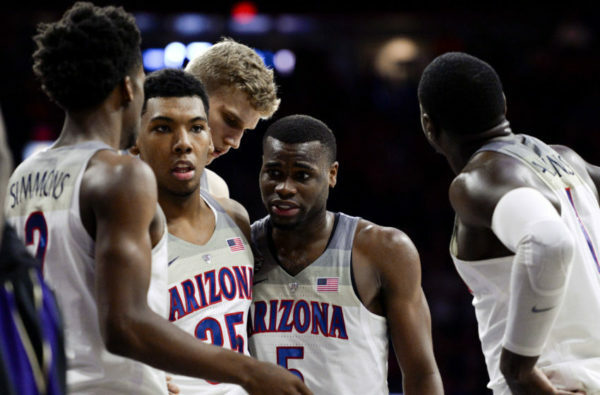 Oregon, Arizona and UCLA begin their second weekend of NCAA Tournament work this evening, so it’s time to check in with each and focus on a key issue to resolve if they are to rendezvous in Glendale. #3 Oregon: #TeamTyler or #TeamDillon? Postseason play has brought this particular debate to the fore in ways many may have not anticipated. After Oregon’s semifinal win over Cal in the Pac-12 Tournament, Dana Altman pulled no punches in critiquing what had been an uneven performance from Pac-12 Player of the Year Dillon Brooks, going so far as to suggest that Brooks had taken the Ducks out of their offense. 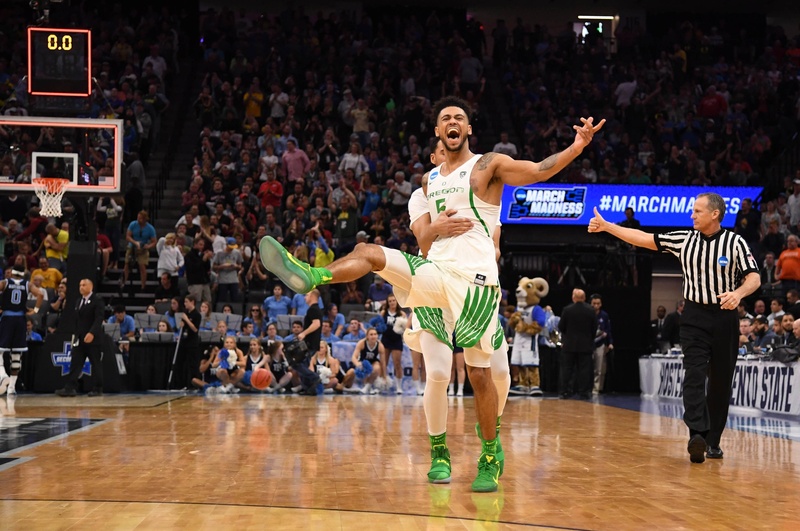 The senior is a fantastic player, but Oregon’s offense has at times sputtered on Brooks possessions, allowing for Tyler Dorsey to emerge as an effective alternative for the Ducks in crunch time. Consider: In postseason play, Brooks is shooting 42.0 percent whereas Dorsey is converting a red-hot 67.0 percent. Brooks has outshot his teammate at the foul line, but not by nearly enough to eclipse Dorsey’s phenomenal streak of productivity. It’s always good to have multiple closers on the same team, and this isn’t necessarily about a fatal choice for Altman in the endgame. The big issue is that Dorsey is playing within the flow of the offense and outproducing Brooks at the same time. To win two more games this weekend, Oregon may have to either re-incorporate Brooks into the natural ebb and flow of its offense or elevate Dorsey to a more featured status. Oregon entered today’s game with the big question on everyone’s mind — how will the Ducks fare without Chris Boucher? At least through the First Round of the NCAA Tournament, that question has been answered. Oregon Got Whatever Oregon Wanted. 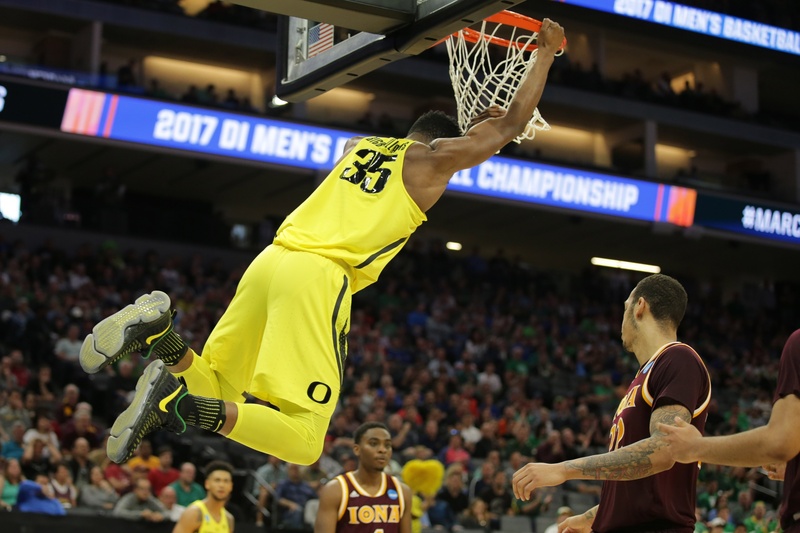 Iona and its defense rated in the mid-200s nationally wasn’t expected to cause much of a problem for an Oregon offense that has no problem scoring, and it was easy to see from the opening tip that the Ducks were going to get whatever they wanted. Oregon made an early point to get the ball inside to Jordan Bell and the junior center delivered, with 17 points on 7-of-8 shooting from the field. At the completion of the first half, the Ducks were hitting 75 percent of their two-point attempts, illustrating just how paper-thin the Gaels’ defense inside the arc was. Although the Ducks tend to feast on the inside-out game offensively, they will certainly see more pushback from their opponent in the next round. What About Boucher? With Boucher out of the lineup, has been able to settle into his natural position at the four. His first game last weekend in the full-time role resulted in a solid 33-minute, 25-point performance against Arizona. Today was another 30+ minute outing, but after a quick start, Brooks seemed more content letting his teammates contribute. He still ended the game with 18 points on 6-of-11 shooting. The more concerning area, of course, involves the loss of Boucher is on the defensive end. 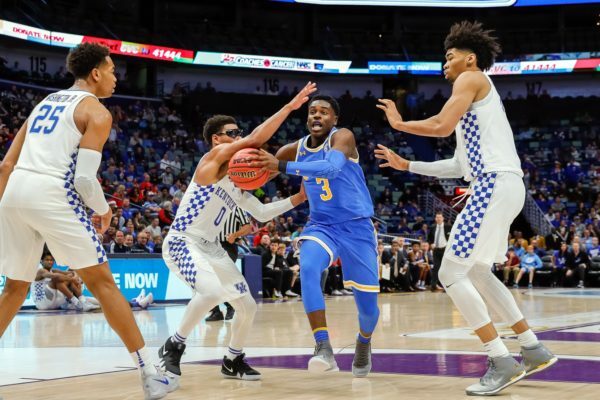 Brooks was often matched up with the bigger and bulkier Jordan Washington (along with Jordan Bell) inside, who easily overpowered the pair for a 22/11 double-double. The loss of the rim-protection that Boucher offered is definitely something to watch going forward. Iona Has Had Better Showings. This was Tim Cluess’ fourth trip to the NCAA Tournament in seven years at the helm, but these Gaels probably represented his weakest group to go dancing. Aside from Washington inside and Sam Cassell, Jr. (16 points) on the perimeter, the Gaels were overmatched by the speed, talent and athleticism of Oregon. Other than a brief period in the mid-second half when it appeared that the Ducks became complacent, they were never really tested today. Cluess’ teams have never been great defensive squads, but with only two legitimate scoring options on the floor today, it ultimately meant the Gaels were always playing catch-up against the refined group of offensive talents that Dana Altman has at his disposal. Star of the Game. Tyler Dorsey, Oregon. Speaking of getting whatever you want, Dorsey used his versatile offensive game to torch Iona for 24 points on 9-of-13 shooting, including a pair of threes and five rebounds. The sophomore’s fourth 20+ point game in a row, it’s clear that Altman believes that his time is now.